‘One can’t describe what pure transcendence is; it is beyond knowledge; it is zero; but the borderlands of transcendence are exactly what art is about and it is quite clear what those borderlands are. Sometimes you are just on the edge of transcendence, other times you are somewhere within the region and that is quite easy to describe because it has a lot of connections with the normal states of consciousness we move in day by day, so it can be mediated in those terms. Once one has a clear idea of what is at the basis of art, although art can never actually say it, I think it can induce such experiences in people by suggestion and encouragement: one can then see more clearly the aim of art and where to go, and life becomes very exciting at that point’ – Jonathan Harvey in conversation with Arnold Whittall. Christmas greetings to all my readers. * The more browsable 'active view' presentation will prevail over the Christmas break, but, fear not, the 'passive view' Overgrown Path will be back soon. 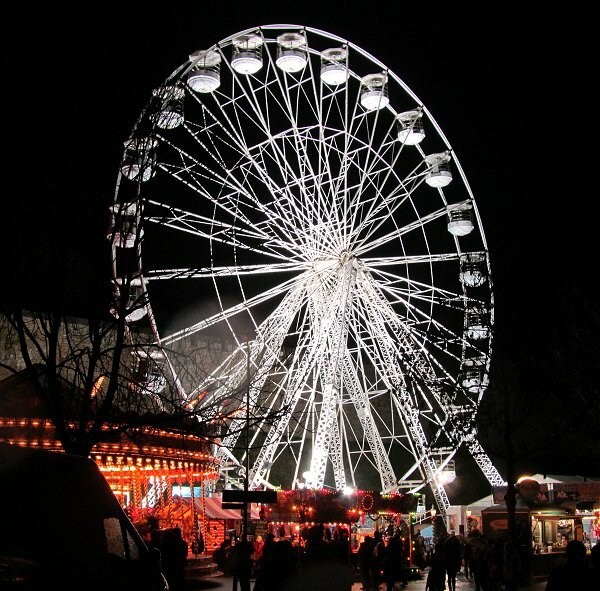 Photo of Ferris wheel at Lincoln Christmas market is (c) On An Overgrown Path 2012. Any other copyrighted material on these pages is included as "fair use", for the purpose of study, review or critical analysis only, and will be removed at the request of copyright owner(s). Report broken links, missing images etc to - overgrownpath at hotmail dot co dot uk Also on Facebook and Twitter.